Info on lessons from Town Center Music. TCM believes in music education. We find only the best instructors who only have your musical goals in mind. Want to do a deep-dive into music theory? We can do that. Want to strum & sing a pop tune that just makes you feel good? We can do that do. Let our instructors create a custom curriculum centered around your goals, so you can make music with your own undeniable style. Why Are TCM's Lessons Better? This ensures every student gets the attention they need. We offer lessons Monday thru Saturday, and we close at 8pm Monday thru Thursday, so we’re sure to have a time that will work for you. Learn the songs and styles you want to learn without sacrificing fundamentals. These aren’t house framers looking to make a few bucks on the side; these are background checked professional music teachers dedicated to passing on their love for music. As a matter of fact, check out some of our Instructor Profiles here on our website. Every one of our students gets and additional 15% off any item over $100, lower Rock Camp tuition, and a student referral bonus. Refer any new student to us, and both students receive a free lesson. Quarterly Student Nights at Local Venues. Perform for family and friends at local venues, and get a limited-edition poster for participating! We understand the attraction to online guitar lessons: convenient, abundant, no need to change out of pajama pants - it sounds great. But how can an online video tell you your finger position needs to be changed? Can an online video encourage you when you just nail that tough passage? Can an online video re-arrange your favorite song to make it easier for you to learn? There's no substitute for the relationship you develop with your teacher as they encourage you and give you exactly what you need to accomplish your musical goals. 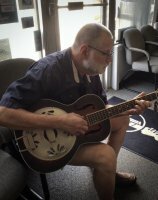 What instruments can I learn at Town Center Music? According to experts, if you want to be a rock and roll star, just get an electric guitar, take some time, and learn how to play. 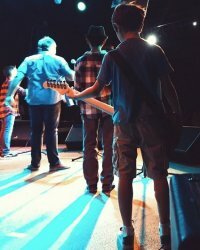 At Town Center Music is home to some of the best electric guitar teachers anywhere. Our instructors can teach you everything from classic rock, modern rock, punk, ambient wash, rockabilly, and even genres so new, they don’t have names yet. By far the most popular instrument we teach, everyone loves a good acoustic guitar player. Town Center Music offers acoustic guitar lessons so you can delicately fingerpick, flatpick some bluegrass, or strum percussively until your guitar looks like Willie Nelson’s. Straddling the line between rhythm and melody, a great bass player is always in demand. Town Center Music offers bass guitar lessons for beginner to intermediate players, that’ll have you slapping, popping, and thumping your way into the nearest groove. Even in this era of electronic music, there’s nothing quite like sitting behind a real drum kit and pounding out a beat. Town Center Music offers drum lessons that will pump up your proficiency behind the kit, or give you a leg up on orchestral drumming. Learning piano is a terrific entry point for all musical styles, from pop & rock, to jazz & blues, and even classical & country. Town Center Music offers piano lessons for all ages, to give you a great musical foundation. Who could’ve predicted the enduring popularity of the ukulele? You can’t surf the internet for more than five minutes, it seems, without stumbling across a ukulele cover of a popular song. Town Center Music offers ukulele lessons for all ages and skill levels, so you can be the life of the party. Click above to get to know our fantastic instructors. This is the agreement everyone signs before beginning lessons at TCM. We thought you might want to look at it. Click above. Have more questions about lessons? Feel free to call us (770.831.7936), or email our lesson supervisor.